On Wednesday, March 29th, 2017, British Prime Minister Theresa May invoked Article 50 of the Lisbon Treaty to officially trigger Brexit negotiations. On this date, May met her self-imposed deadline and fulfilled her promise that “Brexit means Brexit.” Article 50 gives EU member states two years to carry out the negotiations necessary to mediate a split from the Union. On the one-year anniversary of the article’s invocation, the pace of negotiations lags behind expectations and calls into question just how clean a break from the EU Britain will be able to make. Is Brexit going well? Play-by-play coverage of the negotiations makes it difficult to assess their general trends, especially as different news outlets frame different events as successes or failures for Britain and the EU. Everyone has a different definition of “progress.” That said, compromise, regardless of who sacrifices more, is objectively a form of progress towards closing a deal. In that respect, Brexit negotiations are not going well, as Britain and the EU alike find it difficult to make concessions on major issues even one year in. Another persistent obstacle is the negotiation of a border between Ireland and Northern Ireland. This is one sore point that doesn’t seem to be going away. Just recently, Irish Taoiseach Leo Varadkar shot down the suggestion that the new border follow the example of the Canada-U.S., border, on the basis that even a relatively efficient hard border crossing will prove detrimental to Ireland. Currently, the open border is essential to both the Northern Irish and Irish economies, as people commute across the border for work and goods cross for sale. Yet another border with an uncertain future is Gibraltar; the tiny British possession is highly dependent on Spain for labour and goods, and a new hard border would prove economically devastating. 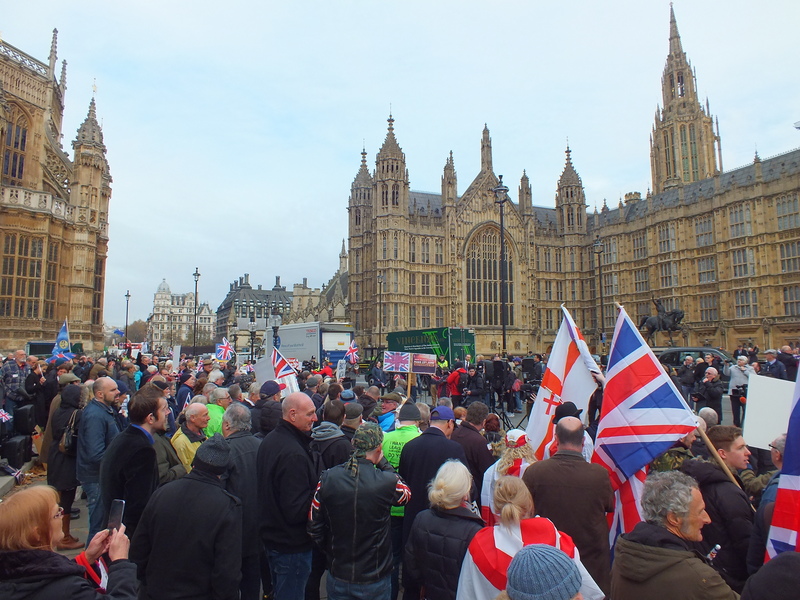 Brexit rally outside of Parliament on November 23rd, 2016. Finally, Britain still can’t work out the terms of its involvement in the single market, allowing tariff-free trade in Europe. Britain wants to maintain some of the privileges of membership in the single market without actually being beholden to it. As the Financial Times writes, “[there] can be no compromise on these conditions — the credibility of the single market depends on it.” Looking back, one of Brexit’s selling points was a rejection of trade agreements with Europe in favour of building trade relationships with the rest of the world. Unfortunately for Britain, today it seems as though the prospect of tariffs from Europe is one of the biggest public fears over Brexit. Europe is using this as leverage to force Britain to make concessions on other issues. Specifically, the free movement of people within the EU is often regarded as the concession Britain will have to make if it wants to stay in the single market. As far as potential outcomes go, the difference between a “hard” and “soft” Brexit becomes critical. Simply put, a ”hard” Brexit is one in which the UK cuts itself off completely from both the responsibilities and privileges of its ties with Europe, and a soft Brexit is one in which Britain retains some continental ties in order to continue to enjoy the benefits they bring. Theresa May stands by the goal of striking the best Brexit deal for Britain. At this point, it looks like stalled negotiations will force Britain to make serious concessions in order to retain the benefits of being in the EU that it is reluctant to give up. With each day of stalled negotiations, it seems more and more likely that a soft Brexit will be the end result by the time negotiations are concluded. This means that Britain’s relationship to the EU could look much like Norway’s: hard borders and membership in the European Economic Area but the ability to escape the “political baggage” of EU membership. There is “no exit from Brexit,” says May. There is, however, an alternative route, and at this point, it may be Britain’s best option.